Things Are Breathing in My Kitchen! In the spirit of continued care of our gut health, I whipped up another batch of naturally fizzy ginger ale this morning. Super easy and full of wonderfully healthy probiotic organisms, we drink 1-2 cups of this delightful drink everyday. It all begins with a "Ginger bug" which is a starter culture for the ale. Ginger, water, and sugar make the bug. After about a week on the counter it fizzes a bit and stringy stuff forms in the slightly gelled liquid. What kid wouldn't love this? The ginger ale is only one process further. A "wort" is made with some water, sugar, and ginger which are heated to boiling so that the sugar melts. More cool water is added and when the temperature is sufficiently cool (<110°) some of the bug can be added. Into a jar or 2 it goes to sit on the counter until it becomes fizzy. My last batch sat for a couple weeks due to the cooler temperature in the house now that it's winter. In summer it can take only a few days. These are living foods that don't obey recipes so it takes some monitoring. I adjust the sweetness with a little stevia, strain and bottle. That's what I did yesterday which is why I am starting a new batch today. This could be a fun project for a family who wants to get away from sodas which only serve to destroy health. This ginger ale actually contributes to health by feeding and fortifying the natural flora of our digestive tracts. This microbiome is a big basis for our overall health so it pays to treat it well. I have been making ginger ale for awhile now and soon I'm going to try fruit sodas. Cheap, healthy, easy? Right up my alley! If you want help getting started with fermenting, check out our Healthy Microbiome class for MTs AND anyone! "I love to give credit when it's due!! I had a massage tonight from a new student. I was her first official client. Her first massage was AMAZING!! When the massage was over I told her instructor, Miriam, how impressed I was. 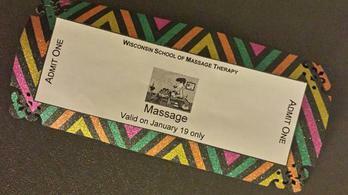 The Wisconsin School of Massage Therapy continues to produce top notch students!! I believe it's because they have great instructors like Mary, Robin and Miriam." I tell students all the time that there is always room for excellence in any profession. It does not matter how many people are doing the same work. It does not matter how many massage schools are in our area. When you put your heart and soul into your work you will always stand out. When you really care about your clients and try to do your best for them they know it. Students get nervous about their first clinic massage, but even that first massage, when they are well trained and they give it their best, is noticeably excellent. I love it that we nail it all the time. I just got back from a morning at Northbrook Church where the mom's group was having a spa morning. I did 10 minute chair massages for some of the women who won door prizes. They were so excited to have won! And I was honored to be their prize! 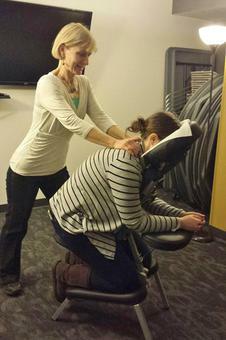 In some programs chair massage is an extra continuing education class after the basic program is complete. We include not only relaxation massage, but also therapeutic work for clients on the chair in our basic program. This is because the chair is a great tool. It's great for promotion of a business (like my morning today), as a tool for use with clients in a business who step away from their desk for a few minutes, and as an alternative to the massage table for clients who can't lie down for a variety of reasons. But it is different to work with a client on a massage chair, both for the body mechanics required and because of the nature of the short sessions (usually 5-15 minutes.) We like to make sure students get good training on how to work with a client on a chair both for safety and effectiveness. People tell us all the time they love how logical and practical our program is. Including chair massage in the basic program is one way we do this. Come join us and you could be someone's prize too! In trying to stay healthy and accomplish several things at the same time I've come up with these cookies. What are those goals? Well, maintaining my weight loss and avoiding gluten and unnatural commercial ingredients in food are big goals for me. I love chocolate chip cookies and I wanted to try making a better version. Start by melting the coconut oil on the lowest setting on the stove or in a bowl of hot water. Put that in the mixer with the other fats and the sugars. Mix well and add the eggs and vanilla. Put the flours, baking soda and salt in a separate bowl and mix with a spoon. Add to mixer. Throw in the nuts. Bake at 350° for about 15 minutes or until golden brown. Let cool for a few minutes. Try not to eat them all. I made a double batch and then I got mad at myself because I ate 3. I wanted to eat 1. 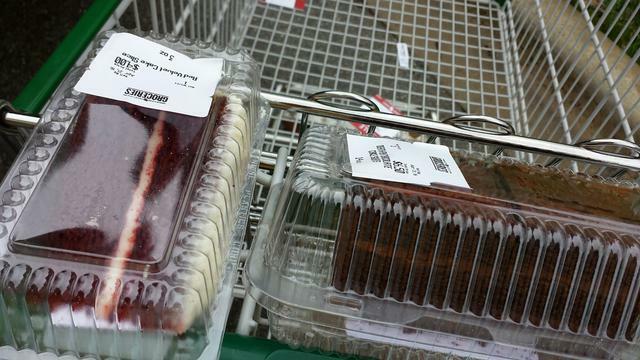 But then I remembered the years when I would have eaten a dozen or more so I cut myself some slack. Since the first day I have eaten 1 each evening for dessert except for one day when I ate 2. The scale has confirmed that this hasn't been too much. These cookies are not health food. The flours aren't great for me even though they are not wheat. The sugar is still not great for the blood sugar. But these do have some nutrients to offer the old bod. The fats are really good and the eggs are great. The nuts and the teff flour especially have lots to offer. I have to have treats! And as long as they are better quality and eaten in moderation it's all good. If you try these let me know what changes you make and how they work out for you! I haven't consumed commercially made soda for years. There is the NutraSweet, or high fructose corn syrup or sugar. There are all the chemicals and the phosphorous fizz which eats at the bones. Nope, I don't even like how it tastes anymore - such strong fizz it hurts my mouth and such intense sweet it makes my teeth hurt. I'd rather have water with a little lemon perhaps. But now I've discovered homemade probiotic sodas! They are just a little sweet because that's how I like them, and a little fizzy from all the good bacteria working in the bottle. No phosphorous or special soda machine needed. It happens naturally! I started with ginger ale. Then, as an aside, I started making my own elderberry syrup to combat colds and flu. The leftover berries still looked like they had life in them so I cooked them up a second time and made elderberry soda. It is delicious! I have also made lemon soda and now I'm about to do pomegranate and tart cherry. The variations are endless. When you drink a glass of this stuff it tastes good and it's good for you. It gives you a nice boost to your system with a dose of healthy probiotics. I'm holding a class on Sunday, February 21. Check out our Continuing Education page for details. You could be making your own sodas too! Our instructors love to teach and part of that is their never-ending quest to make the learning experience as fun as possible. There is a lot of new information to be learned in a massage program. We utilize a variety of review experiences to help students solidify new information and make it their own. I walked through our classroom the other day to observe this scene so I had to capture it and show off here! 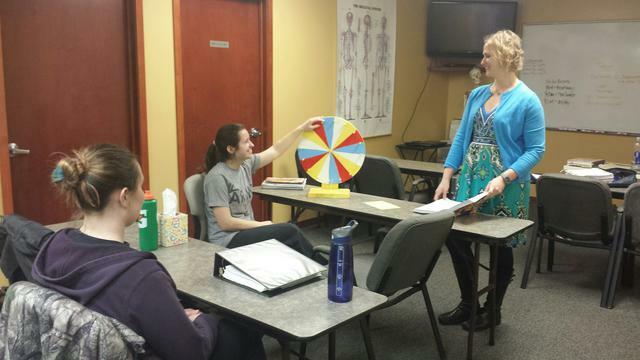 Our instructor, Miriam, was using our fun wheel to run a review game. This tool has become one way our instructors add interest and variety to the classroom. With those bright spinning colors it keeps everyone on their toes. I could hear the brain synapses firing away! "Hey Mary. I just wanted to say thanks! Why you may ask? Long story short, I ... work(ed) a corporate chair massage event on Friday last week. The other therapist I worked with was part of the last class at (XYZ School). Her body mechanics were terrible! So thanks for teaching proper body mechanics from day 1!" We don't just mention body mechanics. We don't struggle to demonstrate it. We don't have graduates out in their professional lives hurting themselves. All the staff at WSMT are committed to the importance of using good body mechanics to perform massage. We all use proper form ourselves and we kindly coach each student until moving this way becomes second nature. Do you want to know why? The truth is you cannot give an excellent massage while using sloppy or incorrect body mechanics. It will create tension in the therapist's body for which compensations cannot be made. Clients can tell every time. It's one very important factor that makes our graduates stand out. They develop a steady clientele without difficulty because their massages are a grade higher than most out there. And the other reason which is truly just as important is that no one will be doing this work for very long without observing proper body mechanics. The human body can only rise to the exciting challenge of this work and feel good when doing so. It's really nice when a graduate contacts me like this because it reaffirms that we are still on the right track. It's heartwarming that they often reflect on their training at WSMT and want to thank us! Congratulations to our latest crop of 5 graduates! We celebrate with them this bittersweet moment - happy for their futures, but sad to see them go. Our graduates always tell us they enjoy school so much they are amazed at how fast the program goes. This graduation day comes fast once you begin! I must say we have been coming up with fun and useful continuing education classes. Here is a photo of our first Anatomical Skull Painting class. Students received a plain skull as part of their registration fee to paint the different bones inside and out. We learned that this is an 8 hour class, not 4, because the cranium is complicated! Participants became engrossed in finding the precise sutures for the different bones. These MTs now have a great visual and tactile aid for their offices as well as a new and deeper understanding of the parts of the cranium. The next time they touch a client's head it will be a more informed touch! We've had a little break from winter weather. Temperatures have reached 70 on some recent days. This means the grill came out of hibernation. Grilled pizzas are a fun way to celebrate! Here is my basic dough recipe. To stay gluten-free I made changes (see parenthesis). Give it a try! Combine yeast, water, white flour. Mix. Add oil, salt, whole wheat flour (and you can add herbs/spices now if you want like powdered garlic or oregano) until dough sticks together. Knead with dough hook for a bit. Roll dough into a ball and place in a lightly oiled bowl. Cover loosely, set in warm place to rise for about an hour. Ready to use after this. Makes 2 balls to make 12 inch pizzas. Or make smaller, 6-inch pizzas for grilling. I find smaller pizzas work better for grilling because I can get my big flipper under them to move them. Just pat the dough into about a 6-inch round and put over a little corn flour on a piece of wax paper or paper plate. Wax paper between pizzas lets you stack them up easily. Then smear some tomato paste onto the dough and dress up with your favorite toppings and cheese. Take to the grill and place on the grates. Close the top and let it cook from below and above at the same time just like an oven. Cast iron grill grates work the best, for regular wire-type grill use a pizza or vegetable pan for grilling. The grill can often get much hotter than your oven, much like the wood-fired ovens used in Italy so the crust gets nice and crunchy on the outside with a heavenly smoky flavor. 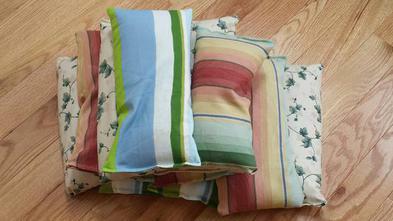 Comfort pillows/rice bags are included for our students. I make them myself. They are nothing fancy, just recycled fabric from a window-treatments company, rice, and some time at the sewing machine. Each students receives one and they serve several purposes. First, we practice a breathing exercise by placing the bag on the abdomen and then lifting it with the power of the diaphragm. It's very strengthening! Secondly, the bags can be heated in the microwave oven for 3-4 minutes and placed on clients' backs (over the sheet or a towel) for a nice spot of heat. The comfort pillows are a nice addition to the supplies of a massage therapist. 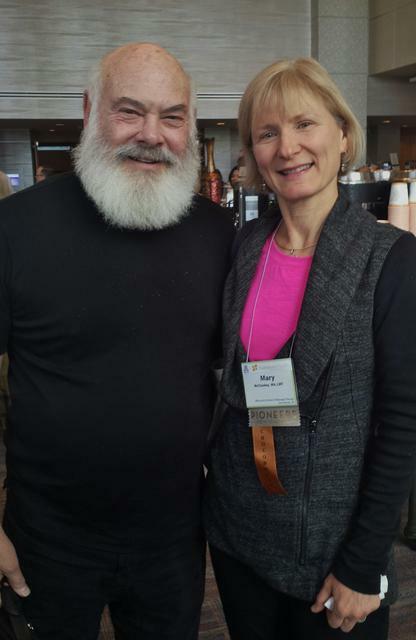 Last week I attended the University of Arizona Center for Integrative Medicine's Nutrition and Health Conference in Denver. I will have lots to report from this amazing experience, but today I'm just posting this picture. I have been a fan of Dr. Weil's for many years. I have read many of his books and watched him on television. I admire his goal of truly integrating mainstream medicine with more natural, holistic methods of healthcare. He started the Center for Integrative Medicine and he has trained many medical doctors in the use of alternative therapies. It was great to hear him speak in person and to meet him. This was a quick snapshot after his book signing. Stay tuned for some reports about the research presented! I discovered avocados back in the 1970s when I was a kid. They were very exotic and expensive, $2-3 each. Then I swore them off when I learned that they are 80% fat. Oh, the fat free era was a sad one! "Avocados provide nearly 20 essential nutrients, including fiber, potassium, Vitamin E, B-vitamins, and folic acid. They also act as a "nutrient booster" by enabling the body to absorb more fat-soluble nutrients, such as alpha and beta-carotene and lutein, in foods that are eaten with the fruit." We need high quality dietary fat, too, and avocados are a great source. 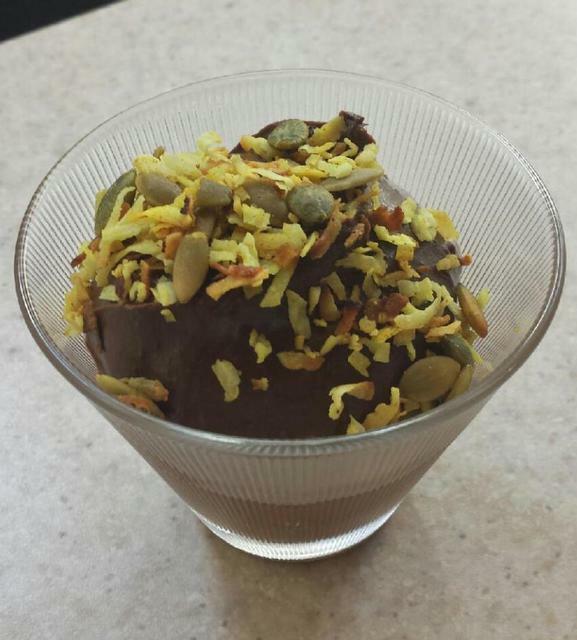 Now if you didn't need another reason to eat them here is a recipe for chocolate mousse made with avocados! Makes a huge batch, 25 servings or so. You could use these ideas and create your own small batch. Just taste as you go and stop when you like it. There is nothing in this recipe that shouldn’t be tasted raw. (No raw eggs, for example). Melt chocolate chips in double boiler, if using, while processing avocados. Use immersion blender or food processor to incorporate everything until super smooth. Taste as you go and stop when you like it! Then scoop into cups and refrigerate. Gets thicker as it sets. In a frying pan on low, toast the coconut and pepitas until fragrant and beginning to brown. Add curry and maple syrup, toss to incorporate. Toast a little more until brown and crunchy. Cool and store separately from mousses. Top immediately before serving to keep crunchy. There are difficulties to working with coconut flour, however. If you swap it for flour, you will find it doesn't work well. It is usually very dry, absorbent, and clumpy. This recipe works very well to produce a dense and moist cake with rich lemon flavor, though. Enjoy! 1. Preheat the oven to 350℉ and grease a 7.5” by 3.5” loaf pan. 2. In a mixing bowl, whisk the eggs with the coconut oil, maple syrup, lemon juice, and lemon zest. 3. Add the coconut flour, oat flour, baking soda, and salt. Mix well. 4. Transfer to prepared loaf pan. Bake for 40 minutes, or until a toothpick inserted in center of cake comes out clean. 5. Remove from pan and cool completely. 6. 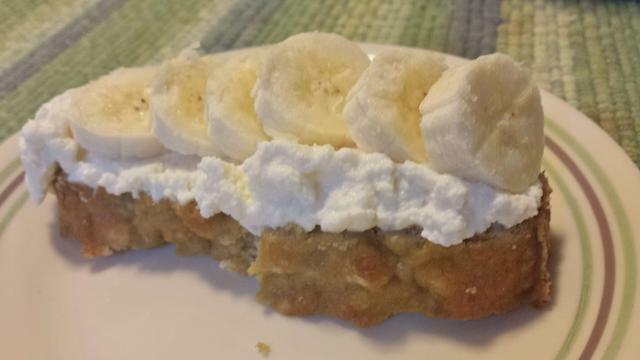 If you want a topping, mix together ricotta cheese, vanilla and sweetener of choice to taste. Spread on each slice of cake as served. Top with fresh fruit of your choice. Or maybe you are not quite ready. You don't feel that you have enough information. Then maybe you want to join one of our Introduction classes. Check out the information at the left. Try your hand at real massage work, coached by a real expert...me! I would love to meet you and show you the ropes. We are excited to be offering Health Coaching services at WSMT now. I have become an ACE-certified Health Coach and I’m excited to be working with clients who want to improve their health. Miriam Mitchell, one of our top instructors and professional massage therapists will be joining me in this work soon, as well. How did this come about? Did I really need another job? Well, I’ve had an interest in nutrition, exercise, stress and weight management for years. It is really exciting to have the training and expertise now, to work with individuals who want the inspiration and guidance to make better choices for their health and the health of their families. Who should consider hiring a health coach? • lack the time to even think about these things! Please consider engaging with me in a journey to better health! Let me take the boredom, confusion, and frustration out of eating, exercising, and feeling your best! Check out our Program Choices by clicking this LINK to go to our services page. Look what I discovered a few steps outside my front door this cold, blustery morning! FREE FOOD! And not just any food, but one of the kings of tasty and healthy foods - kale! I love how kale survives the most brutal of winters to come back in spring with fresh green leaves bursting with nutrients. Kale is one of those foods that is great for brain health, cancer prevention and support, energy, you name it! I snipped these leaves and very soon I had a salad spinner full of kale. I rinsed and spun it, then dumped it out on a cutting board to roughly chop it. Into a big bowl it went with a drizzle of olive oil and rice vinegar. A toss and it's in the refrigerator. By dinner time it will be softened and ready for a shower of grated parmesan and black pepper. I may add some chives I also found outside as well as diced red pepper for color and added nutrients. It's so easy and took me 5 minutes. 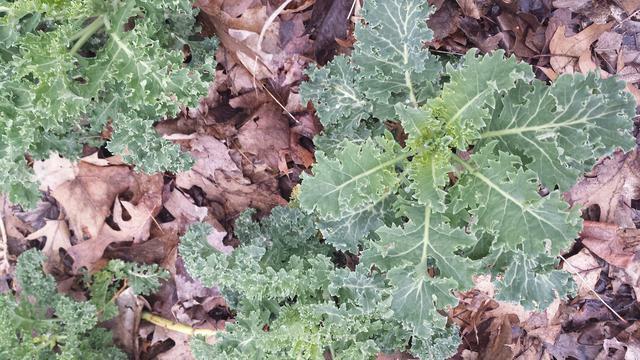 By planting kale you get to eat it the first year and at least one more year! If you thought you couldn't afford to eat healthy food. It CAN be free! 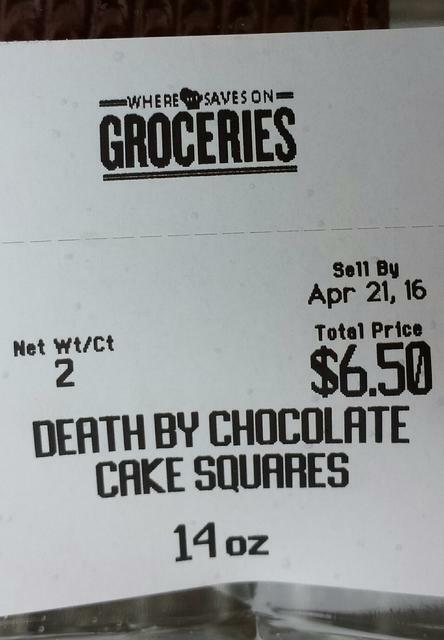 Grocery store baked goods are sometimes named, “Death by Chocolate,” and that’s not an exaggeration if you read the ingredients list. If I’ve counted right, a proper chocolate cake should contain 9 ingredients (some of which make the frosting too, so still 9). 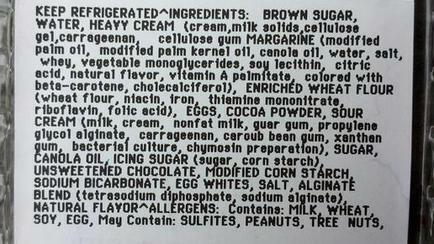 The chemical cake above contains something like 49 ingredients. Why? Have you ever asked yourself why, for instance, a supermarket puts something like propylene glycol alginate into a chocolate cake? “There are three primary reasons for using propylene glycol alginate. First, it thickens liquid but it also stabilizes it. For example, the foam in beer can be stabilized by using this chemical as can fruit juices or foamy dairy products. It is also considered an emulsifier, which means that it keeps foods (together that would tend to separate and it keeps food) fresher because it acts as a preservative. Certain foods have a tendency to change color or consistency over a period of time, for example, and this chemical helps to slow down that process. Although it is considered a safe additive, there have been reports of negative side effects. It can produce stomach upset and nausea, whether it's ingested or used on the skin as a cosmetic. When it is only used cosmetically, it can cause allergic reactions that include hair loss, rashes, and eye irritations. Cosmetic use is the most common cause of side effects. Other skin-related allergies can occur when household cleaners that contains this ingredient are used. So, the grocery store bakery included an ingredient that prevents the natural deterioration of a food product so they can keep it on the shelf past the normal time a cake would last. They also wanted it to make the cake artificially more dense. This is not the only emulsifier on the list. See here what emulsifiers are turning out to do to the healthy microbiome of humans. I don’t want propylene glycol alginate or any of the other 39 unnecessary ingredients in any chocolate cake I eat. I’d rather eat, “Life by Chocolate Cake.” Which is what everything we eat should be supplying: Life! Learning to read labels and discern what they mean for your health is a specialty of health coaches. Are you overwhelmed by all the diet information available today and how to navigate the confusing labels on packages? We are here to help! See our services page for health coaching services and start making choices at the food store for a life instead of letting them sell you food-like products that will live up to the name of that chocolate cake! Here is a photo from last Septembers continuing education classes at in North Dakota. What a privilege and a joy to travel 2 states from home to help fellow colleagues progress in their education! One of the class days this year will be called, "The Brush Up" and it comes right out of requests from last years participants. They wanted to review and refresh the basics. Some things have changed since they went to school. What a great idea! So I'm designing "The Brush Up" to be 8 hours of the latest best practices (Do you still tell people to drink H20 to flush toxins?) and a review of body mechanics, draping, and sharing and honing of massage techniques. It should prove to be enjoyably refreshing. If you are a North Dakotan MT please go to our Continuing Education page for more information. Years ago I wore a pedometer and I found out that I had no trouble getting 10,000 steps a day. This is the recommendation from several sources that ensures an individual is "active." This 10,000 number likely came out of Japanese walking clubs where 8,000-10,000 steps a day is considered healthy. The National Institutes of Health has 5 categories: <5000/sedentary, <7499/low active, <9999/somewhat active, > or = 10,000/active, and >12,500/highly active. 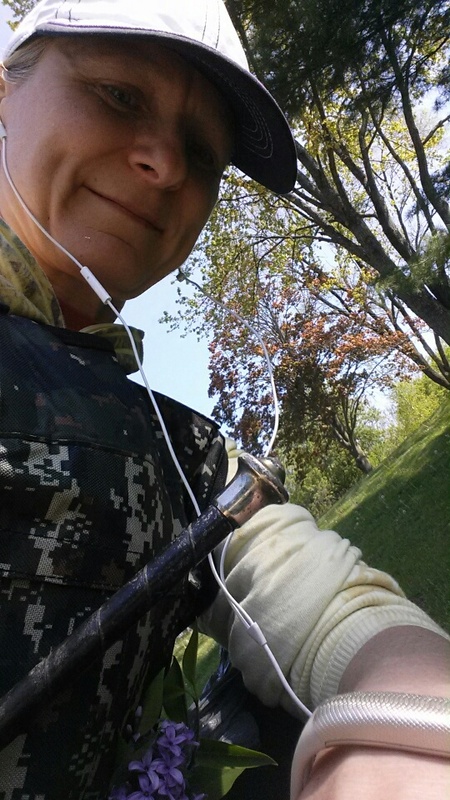 In March I hung out at a conference with my friend, Julie, who wears a Garmin fitness tracker. She would inform me regularly throughout the day that we weren't doing very well so we started running up the escalators and going for walks around the hotel. Back at home I hauled out my old pedometer, got a new battery, and slapped it on for a few days. Hmmmm....how come 10,000 steps didn't come easily now? I wondered if the 20-year old pedometer wasn't working correctly. I started wondering if I should look into these electronic devices worn on the wrist. I found one that is simple and cheap. For $46 I was up and running (after disappointingly returning a lemon that was shipped first, a common problem with these devices, I hear.) I got the app on my phone and started checking several times a day. Wow, now I can really see how I have to work at this a little bit. I've added in extra walking to reach the 10,000 step mark. And being the competitive person I am, I now want to be classified as "highly active" so 12,500 will be a new goal on days that allow for the time. I have found that standing and moving a little even adds up quite a bit compared to all the times I'd sit in a day. I do think this new device has already been worth it because it is pretty motivating to me to check my progress. It keeps movement in the forefront, not something to be dealt with only in a workout time. It also helps me remember I am living in a human body with needs for movement as well as all the others. On top of this (I'm ok with the pun) I have invested in a weighted vest. You can see it in the photo above. It's got slots that hold tubes of iron ore! You can change the weight as you get stronger. Right now I carry 22 pounds for my morning walk each day and I can work up to 40 pounds if I want. This is my attempt to keep my bones strong, especially my spine. The body remodels the skeleton continually and added stress like weight-bearing exercise gets the body to beef up the bones to take it. I think this makes me a true iron-woman!! Ok, there is movement, which is essential to health, and there is sleep, also essential. What about rest, though? I'm talking about a good sit-down as pictured above. We were in the last mile of our hike down Bright Angel Trail of the Grand Canyon to Phantom Ranch for the night. We had made good time at about 5.5 hours of hiking, much of it bone-jarring steps down. And we hadn't stopped much at all in the last several hours. I hit a wall and just couldn't go on. My hips and knees were poking sharp pain at me with each step, my thighs were shaking all around and my good humor had left me. I said, "That's it, go on if you guys want and I'll catch up, but I MUST sit down!!" I didn't know how long I'd need or how I'd feel when I stood up again. It didn't matter. Sitting down was the main message my body was giving me and things were going to get really, really bad if I didn't listen, I knew. Well, it turned out that only 5 minutes or so completely rejuvenated my system. I stood up and walked to the end without any problem. The crisis was over because I had taken 5 minutes to listen to my body and rest. My legs, hips, knees just needed to stop for a bit and collect themselves. Sometimes I have worked with driven athletes for whom the concept of rest has become foreign. Like anything good for us, too much becomes bad. If we sit all day it's devastating for the body. If we stand all day, same thing. If we workout several times a week - great. If working out becomes an all-day and multi-day way to punish ourselves the injuries will emerge. Balance and variety in all - heart-pounding sweating push, a moderate walk around the block, and a good sit-down with a deep breath are all equally important to the body. I must remember not to force my mind over the matter of my physical body, but rather work the mind and the body in concert for best results. How do you eat an elephant? One bite at a time so the saying goes. People who are working full time during the day, but who have a dream of becoming a professional massage therapist may think it's impossible. Well, with many schools it is. WSMT is one of the few that accommodates working people with a night class. Night classes are a little harder to get off the ground, however, so we don't offer as many as day classes. We DO have one starting right around the corner, however! June 28th begins a Tuesday/Thursday and Saturday morning night class just for you! It's only 2 evenings of your working days and 3 Saturday mornings a month. By August of the next year you've made your dream into a reality. Why wait? We are here to guide you through the education so you can get the state license and move into the next phase of your professional life. It can start today with a phone call (262-250-1276) to get a tour of the school! Congrats to Sam and Henry our most recent night class graduates! They are off and running to their Wisconsin State Licensure in Professional Massage Therapy. Both have big plans for a bright future. Why not join us for our next night class starting very soon! Every year we volunteer at the MACC Fund (Midwest Athletes Against Childhood Cancer) Trek 100 bicycle ride in Waterloo, Wisconsin. It gives us a chance to contribute to a great cause and to practice our skills with sports massage. Athletes are a special population in massage with some unique needs. We spend a little extra time learning to address these needs with massage work. Many of the students were surprised to find their clients' needs were extremely varied in spite of the activity being the same for all of them. It was good to see in action the concept that each client is an individual who comes to our table with a unique set of circumstances. Students rose to the challenge of quickly adapting whatever they were doing to be useful for each and every rider. This, in spite of the heat of this beautiful summer day! 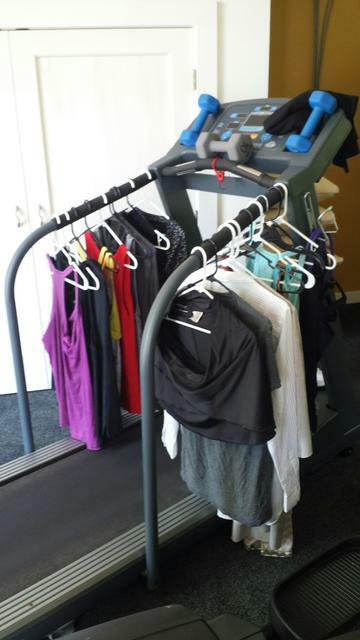 ​Are you laughing at the treadmill above that is being used as a clothes drying rack? Maybe you have a similar piece of equipment at home that is doing a different duty than which it is intended!? Well, don't laugh so quickly because I know the owners of this treadmill. The reason it is not being used much these days is because it is summer! It is a good time to ditch the indoor activities that are often a necessity in winter. Bicycling, hiking, and swimming are just a few of the options open to Wisconsinites now! When you move your normal activities outside you get the benefits of new terrain which provides a variety to the physical demands as well as vitamin D-filled sunshine and the peace of mind that comes from fresh air and a view of green and growing things. Don't laugh at the owners of that treadmill above, JOIN THEM!